We are Rural, Southwestern Michigan based REALTORS® with experience and expertise in all segments of the Real Estate market (farm, commercial, residential, lake and land sales) in Three Rivers, Centreville, Mendon, Marcellus, Sturgis and surrounding areas. We are seen as creative, smart, charitable and involved in the communities we serve. 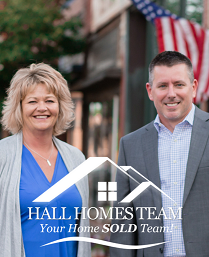 Combining Garrett Hall's 16 years of Real Estate experience and Jenny Koski's 20 plus years of Customer Service, web experience and dedication to her clients, we are bringing our clients the best in marketing strategies, negotiations, and client services. With 66 closed transactions in 2017, that puts us in the top 4% of Agents of Berkshire Hathaway HomeServices Nationwide. Whether you are looking to Buy a Home for Sale or Sell your home, We are here to help with all your Real Estate Needs! Contact us today! Garrett was very professional, got us results that exceeded our own, and moved very quickly. Photos were very professional, and the virtual tour was amazing. I feel like he went above and beyond to help us, and selling our house, with our circumstances, would not have been possible without his effort. Curious if your home's value is rising?